It's been far too long since I've shared anything on mental toughness, so here you go. 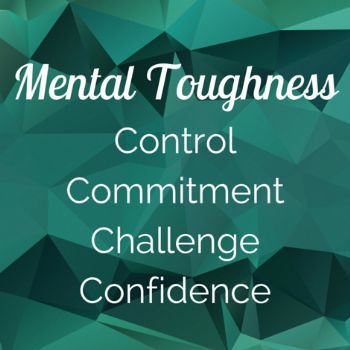 There are a ton of ways to define "mental toughness", so I'm keeping it simple: It's how you respond to stress, pressure, or challenges, and is made up of 4 components. 1. Control - How in control of your circumstances (everything outside of you) and thoughts, feelings, actions, and results (everything inside... of you) do you feel? 2. Commitment - How well do you stick to your goals? 3. Challenge - How do you view stress and pressure? Opportunity or threat? 4. Confidence - How much do you believe in yourself? So why do you care about mental toughness? Because TALENT AND INTELLIGENCE IS OVERRATED when it comes to success. Your ability to persevere and stay passionate for your long-term goals trumps talent and smarts. Mental toughness isn't just for the gym, it's for every freakin' area of your life.